Modern 3-room apartment with 62sqm living space invites you to live, work and of course relax. This spacious apartment for 4 to 5 people is located in the 2nd. First floor in a classic MFA house in the southern city of the state capital. AND: This apartment has a small, sunny balcony facing the courtyard. Features: It can accommodate up to 4 people. 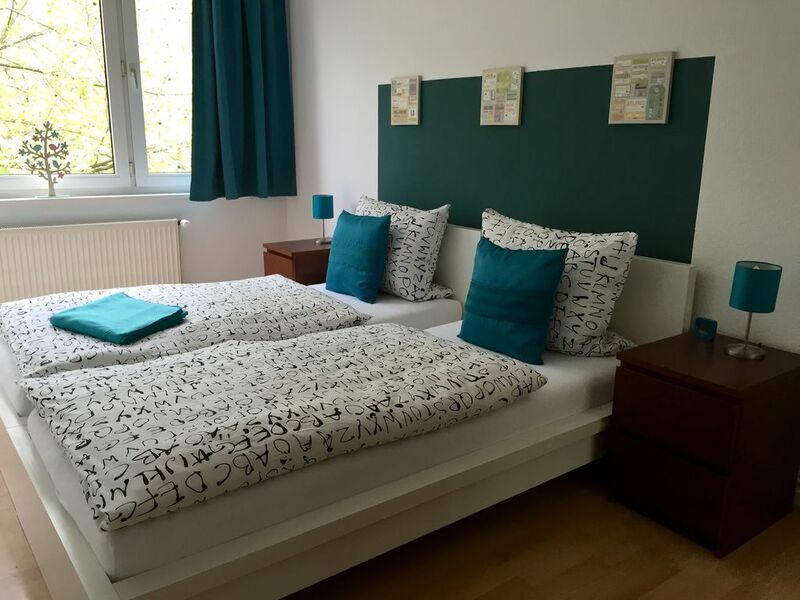 There are 2 bedrooms: 1 room with a bed of 1.80 meters. Room 2 with 2 single beds of 90cm. The rooms are fully equipped with wardrobes, dressers, armchairs, 2 large LED TVs, mirrors, curtains, lamps, magazines, books, etc. A separate, modern dining room with large dining table and 2 benches completes the decor. The cream-colored bathroom has a bathtub (with shower), sink and toilet. Large mirror, hair dryer and sanitary products included. Linen and towel service are of course also included. Free Wi-Fi is of course with us! Location: in the middle of the south city of Hannover. The Maschsee is 600 meters away. 5 minutes walk to Aegi, 10 minutes to Kröpke. Stop Schlägerstraße, only 1 minute walk to the underground (here lines 1,2 and 8) The fairground can be reached in 12 minutes directly, without change. Shops, bakery, banks and restaurants in the immediate vicinity. NDR Funkhaus and Sprengel Museum are within 5-7 minutes, or jog you out of here by the Maschsee ... Everything is taken care of. We look forward to your booking request. Please contact us. The apt. was clean, neat, streamlined, very convenient to our conference at the VW headquarters. The landlady, K. Fuchs, was really helpful. Highly recommended! If I am in Hannover again I will try to stay there. Nice location. Cool apartment near the city center. We enjoyed our stay. We found everything we needed within walking distance. Our boys commented how comfortable the beds were every day. Off street parking was nice. Convenient, fun and clean. Great place! This is a great and clean place to stay. Very convenient location. Katrin, the owner, is wonderful and very accommodating to her guests. Would love to rent this place again! Dear Stephanie, thank you very much for your review. This is a very stylish, well kept, stylish and comfortable apartment that is incredibly convenient. Not only is it only a 20 minute walk from the train station (or a 3 minute/2 stop subway ride) it is only a 15 minute ride to the Messe Convention Center (closer than almost all the hotels). The subway stop is only a few steps from the front door. There is a great grocery store across the street, a dry cleaner, a laundromat and a drugstore within a few steps. I was even able to get the literature printed I needed for the trade show I was attending at a print shop just a couple of doors away. As well, there are a number of great restaurants (including a fantastic bakery next door) all within a few minutes walk. If you need to go to a meeting in the City Center, all the hotels, shopping, etc. is only a few minutes ride away on the subway. Forget staying at one of those super expensive hotels (that call themselves '4 star' but are barely '2 Start'. This place is '5 Stars' . Also, the neighborhood is safe and quiet. Great spot, will definitely stay again when I am in Hannover! Our 1st trip to Hannover. Hilfsbereite Gastgeberin, hat uns sehr schnell geholfen, wie sie konnte. Insgesamt war alles gut und nett.